What makes Silfra so beautiful and special? 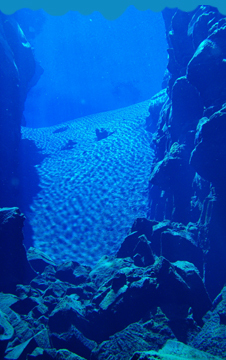 There are several things that make Silfra a unique location in the world and many more that make it a truly beautiful place to visit. First and foremost, Iceland is the only place in the world where you can stand between two continental plates in such a clear manner and more specifically, Silfra is the only place where you can dive or snorkel between them. Iceland holds many beautiful places, one of them undeniably being Thingvellir National Park, but thousands flock here each year with the express intention of seeing the underwater beauty of Silfra. The only way to see this dramatic sight it to join one of the tours offered by operators like Dive.is, the longest running dive and snorkel company in Iceland, who offer a fantastic introduction to this underwater world. Despite the cold temperature of the water it is truly a spectacular experience to see the crystal clear waters of Silfra. Watch how the light plays on the surface like glittering diamonds, and then see how the sun sends its rays straight down into the depths, creating rainbows on the rocks, wherever it touches. This fabulous phenomenon is caused by the water being so clear that it refracts light the same way that crystals do. Whether you come in summer and see the bright green algae that add a magnificent splash of colour to the rocks, visit under the never ending brightness of the midnight sun, or come in winter, when you can watch the sunrise at midday and see snowflakes floating on the surface as they take a few minutes to melt, Silfra holds her beauty throughout the year.